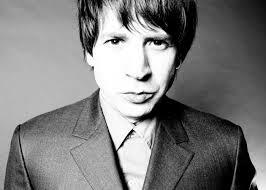 This is the new site for Portland, Oregon jazz drummer, bandleader, and Origin Records recording artist Todd Bishop. Hit the “Listen” link to listen to our music while you browse the site— the player will open in a new tab. On the news page there are new reviews, airplay, concerts, and info on our December 2015 Europe tour. On the about page you can find band information, and bios for Bishop and collaborator Jasnam Daya Singh (Weber Iago). On the media page, there are select reviews and press quotes, and media downloads: press photo, press kit, promo CD download. 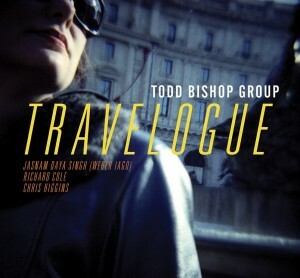 Travelogue is a new CD of Bishop’s original jazz, composed in collaboration with Brazilian pianist Jasnam Daya Singh (Weber Iago). Also included are tunes by Bishop and Singh individually, by saxophonist Richard Cole, as well as a cover of Only Shallow, by the 90’s Manchester psychedelic band My Bloody Valentine. The musicians are Bishop, Singh, Richard Cole on multiple woodwinds, and Chris Higgins on bass. 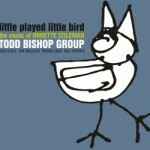 Little Played Little Bird is Bishop’s 2012 highly listenable CD of seldom-recorded tunes by pioneering free jazz saxophonist Ornette Coleman. Musicians include pianist Jasnam Daya Singh (Weber Iago), and saxophonists Richard Cole and Tim Willcox. Included are Coleman’s Mothers Of The Veil, Enfant, Feet Music,Comme Il Faut, Friends And Neighbors, Check Up, the famous, much-played Lonely Woman, and more. 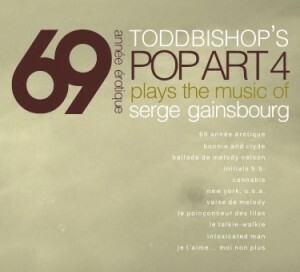 69 Année Érotique is Bishop’s eclectic, radio-friendly 2009 recording of modern versions of tunes by French pop songwriter Serge Gainsbourg. With Wurlitzer maestro Steve Moore (aka STEBMO), saxophonist Richard Cole, and guest vocalist Casey Scott. Includes eleven Gainsbourg tunes, including 69 Année Érotique, the famously scandalous Je t’Aime… Moi Non Plus, Bonnie And Clyde,Ballade De Melody Nelson, Initials B.B., Valse De Melody, and more.